Yea, so this isn’t really a surprise, but I am not a huge people person. But, you know what kind I can’t stand? The crazy, happy morning ones that are so chipper you just want to strangle them, yea you know what I am talking about, dontcha? I think they are just plain psycho and they just plain annoy me. They stifle me with their quest for everlasting cheeriness. With that being said, one of my friends sent me the BEST.VIDEO.EVER. on those types of crazy people. And I am going to share it with you all because I think it will put a smile on your faces. So, enjoy it and next time you run into one of these types of crazy, happy people you will remember this amazing video! Would you like a cup of PSYCHO with that? Yesterday morning, a friend and I went to Starbucks to get some caffeine. After the crap that happened yesterday morning, I thought the jolt of caffeine could be useful. Little did I know what was awaiting me on the other side of the counter….but Mr. PSYCHO, WAY TOO HAPPY, Starbucks guy. Being the cynic that I am, I couldn’t help but ask him about his jolliness at this ungodly hour in the morning! Starbucks Psycho Guy on Crack (WAAAAAAY To Chipper): Hey there! How are YOU guys? What can I get you? Isn’t it a BEAUTIFUL morning? What a WONDERFUL day! Me (incredulous at his audacity to be happy): WHOA! You are way too happy right now! Do you chow down on coffee beans? Starbucks Psycho Guy on Crack (smiling so big, I think he might pull a muscle): Oh No! I don’t even DRINK coffee! Me (ready to jump the counter and kill him): BUT, you work at Starbucks! What time do you wake up and go to sleep at night? Starbucks Psycho Guy on Crack: I go to bed at midnight and get up at 2:30am. Friend: But that is like 2.5 hours of sleep. Starbucks Psycho Guy on Crack : I know, life is just so grand! I am just so happy and blessed and I LOVE my job! Me (LOUDLY): You are just WAY too happy. Friend: Your smile, as he was talking, was so fake. I thought you were going to jump the counter and really strangle that guy! Me: The thought DID cross my mind. I just hate happy people. Sorry, I know I am behind in these…but I was on furlough! 🙂 So, for those of you still left…I promise to catch up to you this week! Today’s America’s Next Top Blogger is brought to you from a new reader, Thoughts From Under My Rock. I believe she and I might have quite a lot in common in our adventures at the grocery store. And with that being said, makes for very sad times. Her topic was: Tell me about the biggest pet peeve you have regarding other people at the store (grocery, department, pharmacy, whatever), inside the store or out (or both), and then I’d like a very adjective and adverb-filled description of what you’d like to do to them for stirring up your fury… I wanna see if you and I think anything alike. And for some reason, I seem to be plagued with both of these burdens, usually at the same time and usually at the grocery store. Why, oh why do the two things I dread most seem to go hand in hand? Never mind, don’t answer that. I’d rather not know. Anyway, we have just finished off our grocery shopping experience, quite painlessly, I might add and I am off returning the cart, when the KRZY vibe strikes—paging everyone on the parking lot to come and get me. I see a nice grocery cart boy pushing carts towards the entrance of the store, he was literally two feet from me. So, rather than push the cart to the cart collection area, I thought I would call him and just give him my cart to add to his pile. Me: Excuse me. Can I hand you my cart? The honking quickly brings me back to reality, I slowly wave and shrug my shoulders at the people in the car, like…I can’t believe this is happening, trying to point at (the now NOT NICE) cart boy. And, that dear readers, is what happened to me and why KRZY vibes and Connecticut just don’t mix. EVER. I have a serious problem; I’ve decided that crazy people are stalking me! I can’t get away from them. I think that they are a necessary part of my life, unavoidable, yet there…just like speeding tickets, traffic, and long lines at the grocery store. These are not your typical “types” of crazy people that belong in the loony bin, but the kinds that are supposed to be educated, fully functional people that are just irrational and clueless. Don’t get me wrong, I know we all have a degree of crazy in us (myself included) but SUPER CRAZY…that is what I tend to run into….you know the kind….the ones that are just cuckoo for cocoa puffs! I guess the reason I meet so many is to build character, right? But, how many “character building” characters do I REALLY need to learn from?! Honestly, I think I have already met my quota for the year and 2009 has barely got off of its’ feet! I think I am in for a LONG year, already. The only conclusion I can come up with is that I have the KRZY vibe and so the crazies flock to me. The question is: how do I get rid of it? I must emit some type of odor, maybe like catnip where they just flock to me! I mean, really people, REAL.LY. The types of crazy people that I run into who are “cuckoo for cocoa puffs” are of all ages. But, I especially run into the types who you think would or should know better. YOU.WOULD.THINK. I guess what I cannot get over is how very exhausting the crazies are. They make me questions myself: Is it me or is it you? 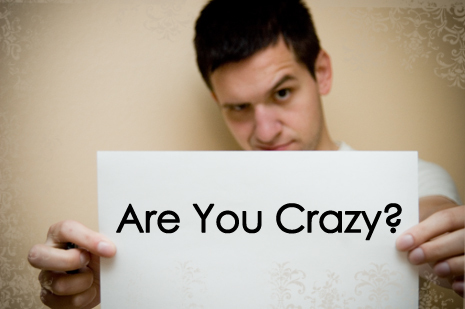 Am I the Crazy one, or is it you? Did she just say that, or am I imagining it? WHAT? SERIOUSLY?! I will continue to try and take the high road, but the detours look so appealing…..don’t they? Maybe you had better just commit me, than the crazies won’t be able to find me, right? RIGHT?! Tomorrow I am summoned to Jury Duty. While most people would probaby not be excited for this….I LOVE the idea of missing work! I know, call me crazy, but a day of people watching ( I like to make up stories about people that I am watching….for instance, see that person that is in the cubicle next to yours….he used to be a mass murderer, until he stole someone’s identity…he is currently scoping you out and soon will kill you and take over your job!) See won’t I make THE. PERFECT. JUROR? Especially with my overactive imagination! Plus, I get to sleep in an extra 30 minutes…..what more could one ask for? So, tomorrow I will report on my crazy day, that is, unless I am chosen to be on a trial…but that would be too good to be true. Imagine missing that much work……WOO HOO! Yea, my luck isn’t THAT good because this morning I broke a small compact mirror, which means 7 years of bad luck are about to be upon me….eh, whatever….I am not scared. YET. I think it might be a conspiracy against me, but the crazy people are still after me! Why can’t I escape them? What odor am I emitting (ok, don’t answer that)? I can’t seem to escape them. Yesterday, I was at work, talking with a co-worker. A lady comes into my area and asks to use one of the computers. Sure, no problem I say and I go straight back to work. Then the lady shouts (she seems to be flustered and I am literally 2 feet away—no need for shouting) this computer is broken! I can’t get it to turn on! The look on my face must have said it all because I look at her (astonished). It helps if you press the large round button below the desktop to power it on. To which she replies. Oh, I see, I am not used to desktop computers. Is this conversation really happening? Why are the Crazies following me everywhere I go?